Okay ORWeenies, it’s that time of year again. After we punted for Gone Girl, Interstellar, Inherent Vice, Into the Woods, Unbroken and Foxcatcher last time (as well as Theory of Everything, Imitation Game, Boyhood and, er… Grace of Monaco), we’re casting a few stones out ahead of the 88th Academy Awards, to be held sometime in early 2016. Bookmark this post, tune back in a year, and see how we do. Ten points for each correct guess from our first category! After Far From Heaven, I’m Not There and HBO miniseries Mildred Pierce, ’90s outsider Todd Haynes has become an appropriately prestigious property. After one nomination – for writing Far From Heaven in 2002 – Haynes may finally break through with the Academy with this Patricia Highsmith (The Talented Mr. Ripley, Strangers on a Train) adaptation. Reuniting with Cate Blanchett (he got her a nom for playing Bob Dylan) for what’ll likely be a mature, intelligent, unique yet slightly worthy story of repression and homosexuality in the 1950s, the meticulous lushness of Haynes’ style could pay off for all involved – including Rooney Mara, as Blanchett’s lover. An Autumn festival launch is likely to push Carol to gilded greatness. Martin Scorsese’s passion projects may be known for their relative lack of popularity – think The Last Temptation of Christ and Kundun, both of which have the same spiritual bent on display here – but his last such film was actually Hugo, which led nominations just three years ago. So the Academy, finally enamoured of the man, could easily throw a huge amount of nominations at this historical epic. Violence, politics, philosophy and human drama will be tied together by an all-time directing master, who has made an interesting lead casting decision by bringing Liam Neeson – not nominated for 21 years now – back to the “serious drama” fold. So Picture, Director, Actor (probably Editing for the ever-brilliant Thelma Schoonmaker), and all the usual tech and craft awards that come with a good period piece. What else? Reliable supporting players Andrew Garfield and Adam Driver should be looking at serious bids in a year’s time. As great fans of both, we’re massively looking forward to it. Basking in the afterglow of War Horse and Lincoln, Steven Spielberg’s back in vogue with Oscar after a few off years. Flukes? No way. This too will be proper meaty stuff. He’s even re-recruited Tom Hanks to prove it. It’s 1960, and an unassuming lawyer has been dragged into the middle of a Cold War diplomatic dispute, trying to save Private Ryan a pilot detained in the USSR. Sounds excellent – and sort of a Spielberg best-of, blending Munich, Catch Me If You Can, and that WWII drama we just alluded to. Audiences (and voters) should love it. Regular collaborators Janusz Kaminski (cameras) and John Williams (John freakin’ Williams) are on board, plus a solid support cast including Amy Ryan, Alan Alda and Mark Rylance. Could go a million different ways come nominations morning – just Picture and no Director? Which cast members’ll get the love? – but assuming all’s well come its 16th October release, wrap up warm and expect a Spielberg blizzard. 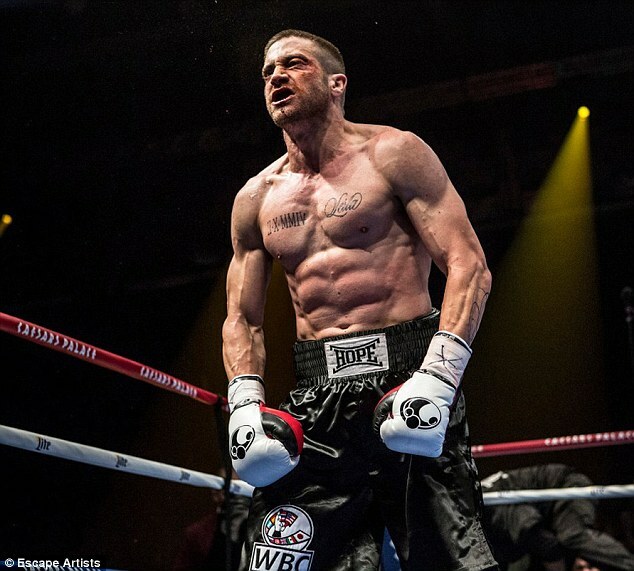 Jake Gyllenhaal also has Southpaw on the slate, but no amount of bodily transformation will circumvent two issues: that film’s a July release, and Demolition simply sounds meatier (psychologically that is, certainly not physically). Plus, director Jean-Marc Vallée has crafted four acting nominations over his last two films (Dallas Buyers Club, Wild) and this sad widower romance looks set to do the same for Gyllenhaal and co-lead Naomi Watts. Could Vallée himself break through? Potentially; he’ll have to step up his game after those last two. Picture, however, is still a strong enough bet if it’s not just about the performances. Watts is always beloved anyway, and perpetually on the lookout for a third nomination; Gyllenhaal goes one better with voter sympathy after consecutive shutouts for Nightcrawler and NBR Best Cast winner Prisoners. Again, it could turn out simply maudlin – but Vallée has a knack for verving up his pictures, keeping his audiences interested enough to fall completely in love. Academy voters love a Hollywood story, and a biopic of the Oscar-winning scribe/legend behind The Brave One, Roman Holiday, Spartacus, Kitty Foyle, Johnny Got His Gun and more is one of the greatest there is. Dalton Trumbo was one of the most famous victims of the McCarthy witchhunts, blacklisted for years – and despite finally being acknowledged by the Academy as a victim (after his death), he is, like Alan Turing, ripe for an apology in the form of a Best Picture nomination. Spurious though that logic is. But it should get there on its own merits, assuming it’s halfway good – Bryan Cranston is the headliner here, and should get ready for a whole lot of campaigning, but director Jay Roach and even writer John McNamara (a veteran producer and TV writer, making his cinematic scribing debut) could do well – if voters remember Roach’s work on the brilliant political films Recount and Game Change, instead of Austin Powers and The Campaign. With Cranston’s Argo co-star John Goodman popping up, as well as Helen Mirren, there’s enough potential brilliance here to make it a big one to watch. Aaron Sorkin’s probably a shoo-in with his adapted screenplay – we’ve all heard by now of its unique three-act structure, each focussing in almost real-time on the lead-up to a different Apple product launch. Even without that innovation, there’s always his unique dialogue to recommend him (if not his gender politics). After much backstage drama, Danny Boyle’s returned to 127 Hours-esque territory, doing his best to inject some visual excitement into all this single-setting stuff. He could be deservedly rewarded simply for turning a potential snoozefest into a genuinely gripping thriller. Michael Fassbender as Jobs is a good prospect, if there’s enough real conflict to work with; but Seth Rogen, as partner/actual computer whiz Steve Wozniak, could easily take a Jonah Hill supporting ticket – imagine that. Stephen Frears has two Directing noms, for The Queen eight years ago and The Grifters before that, and he’s been patchy since as Working Title’s go-to “silly plucky Brits” guy. But after Philomena‘s considerable nomination haul, and with once-nominated John Hodge (Trainspotting) writing, this intrigue drama could do incredibly well. Ben Foster, who most love and want to see do well after a string of solid indies, may smash through to his first nom as Lance Armstrong, a character rich for interpretation as slimy, yet necessarily sympathetic – a compelling balancing act for any actor. This seems a perfect concoction, assuming the team don’t make it too bland. David O. Russell’s last three movies have each garnered Picture, Directing, Writing and three or four Acting nominations. Jennifer Lawrence, Bradley Cooper and Robert De Niro reunite yet again, with Hollywood legend Diane Ladd in her first Russell ensemble – could we see another four acting bids? Well, maybe. This biopic of a struggling single mother who invents the Miracle Mop is most likely to reap gold for its leading lady, but it’s actually the writing process that best signals good ju-ju: Oscar nominee Annie Mumolo (Bridesmaids) wrote the initial screenplay but Russell, no doubt as part of his usual improvisatory process, has allegedly made substantial rewrites. This is usually a recipe for disaster, but here it’s just what Russell does – and this hasn’t done him wrong in some time. Joy will likely be fairly light, but with that deftness and depth that its team do so well. Backed by Megan Ellison at Annapurna Pictures, this Christmas release has only the best chances. Plot? Clue’s in the title. Meryl Streep pops up as Emmeline Pankhurst, though rumours abound that it’s simply an extended cameo. Still, that never stopped Judi Dench in Shakespeare in Love. Never, ever rule Meryl out. The other big prospects from this pic come in the forms of lead Carey Mulligan and Emmy-winning writer Abi Morgan (The Hour). Meanwhile director Sarah Gavron faces good buzz if she steers this into the kind of breakout territory that made her lead actress such a favourite in An Education six years ago. Between the feminist, yet dare-we-say-it “palatable” subject matter, and the general British prestige of the cast and crew, this prime September release should rightly be feared by its fellow contenders. Could Alejandro González Iñárritu overreach in trying to apply his recent stylistic brilliance to the quieter – occasionally completely effing boring – style of old (Babel, Biutiful, 21 Grams)? Because that’s what we’re looking at with this revenge Western. He and a returning Emmanuel Lubezki may plumb new depths similar to the Coens’ True Grit five years ago, though there’s nowhere near enough information to indicate where this sits on that all-important tonal scale. Whatever happens with Iñárritu and his crew, however, the performers have a much greater claim to gold: Leonardo DiCaprio, in a no-doubt highly intense turn, is out for revenge against Tom Hardy. Sounds simple, but Hardy’s got good chances as an acclaimed and overdue actor doing gritty, supporting villainy. He always knocks it out of the park, so with a memorable enough character (read: half-decent writing), at this point he’s the closest thing to an awards shoo-in from this late December release. Facing similar issues is Tarantino’s latest. The script – and consequently the picture as a whole – may be far too pulpy when compared to his controversial previous two, both of which had genuine messages and political drives that The Hateful Eight is simply lacking. That said, it has been rewritten at least twice since last year’s first draft, and this two-time writing winner still injected enough of his usual brilliance into that script. So as a film, it could go several ways. More concrete is, again, the supporting actors: Samuel L. Jackson’s automatically out, as he’s a definitive lead and the character he plays will never cut it in that category; but Tim Roth, Bruce Dern and, more importantly, Jennifer Jason “needs a comeback” Leigh have incredibly plum supporting roles that can only result in good things. Fresh off his Emmy win for True Detective, Cary Fukunaga sets his sights on a different kind of intense drama as a young African boy (the country is unspecified) gets caught up in extreme militancy. Directing and scripting, Fukunaga could be looking at great things with this film – as could Idris Elba, though it’s unclear if he’s primed for a leading or supporting role as the dubious “mentor” of our young protagonist. We suspect the latter could spell better things in a J.K. Simmons way, but whatever happens we know Elba’s gonna smash it. Diablo Cody’s script could be terrible, though whatever happens on that front Meryl Streep’ll be gunning for gold playing a woman her age who decides to become a rock star. The performance will likely be masterfully exuberant with a hint of hilarious-and-touching. Although admittedly her most similar film to date is probably Mamma Mia!. Jonathan Demme (The Silence of the Lambs, Rachel Getting Married) is directing, however, which seals this for us as being decidedly on the good, rather than bad, end of the speculation spectrum. This did so well coming out of Sundance that no matter how “outside” Hollywood Greta Gerwig and one-time nominee Noah Baumbach are, we truly think this could step up to the plate as a spiritual sequel to the pair’s previous Frances Ha which, lest we forget, was actually in a few Oscar conversations at the time. Could it be another Grand Budapest and defy its stubbornly eccentric indie roots to claim awards? These inventive collaborators are liked well enough, and if this almost old-fashioned screwball comedy really takes off with audiences they could look right in the face of Screenplay, Actress and even Directing nominations. The Great Beauty‘s Oscar winner Paolo Sorrentino (good!) directs this English language film (iffy, based on his This Must be the Place) starring Michael Caine (good!) as a retired composer (still good… ) reflecting on his life (keep going… ) and who is asked to perform one last time (DING!). Sounds incredibly rich after Sorrentino’s last film rode a wistful wave to awards glory. Paul Dano, too, has good chances with a supporting role, but sounds like it could be too workmanlike for his oddball talents. We’ll see with this one, but signs are good. Director Brian Helgeland already has an Oscar, for writing L.A. Confidential. He’s not been on top form for a few years, but could do alright with this gangland biopic. At the very least, it’s nice to have a talented American eye revitalise the cliché of the gritty British East-End flick. So with him, we’ll see. As with most films on this list, the strongest prospect (and Legend‘s clear USP) is its main actor: Tom Hardy, here in a lead role. Twice. As both of the notorious Kray twins, Hardy could get in not only on acclaim, but also the sheer joy of a dual role – which the Academy, historically, rather enjoy. This looks juicy. Double juicy. On this list almost out of obligation (seeing as the elements are there), this potentially rather tiresome true-life satire-drama pseudo-documentary thing can only be filed under “tricky”. Director David Gordon Green has had a small renaissance of late, doing great jobs with Joe and Prince Avalanche (after Your Highness… ), finally capitalising on a once-promising reputation as a true indie wünderkind. Plus Peter “Tinker Tailor” Straughan is writing this film. And Sandra Bullock and Billy Bob Thornton are always great, and have been doing well in Hollywood – and with awards ceremonies – of late. But… there’s absolutely nothing to suggest this film won’t become simply insipid, and ultimately the only close thing to a sure-fire recommendation for this film is its screenwriter. So it’s certainly an iffy prospect; just not an impossible one. Tom Hooper, Eddie Redmayne and Amber Heard in a potential recipe for disaster: artists, marriages and transgender issues. The signs do look good, but between backstage issues (Hooper replaced Tomas Alfredson not long before principal photography) and the nagging feeling that this’ll be 2015/16’s awards answer to Mr. Turner, we’re not even sure if the brilliant, transformative incumbent statuette-holder Redmayne can secure a nomination. Even if he is absurdly attractive in his MTF stage. If Derek Cianfrance (Blue Valentine, The Place Beyond the Pines) keeps this closer in tone to his previous films, then forget it. It certainly sounds like The Light Between Oceans could be an even deeper excursion into slow-burningness as Michael Fassbender and Rachel Weisz, a couple living remotely in an Australian lighthouse, adopt a baby who washes up on their island. It’ll probably be brilliant, but depending on how the material’s handled, it may prove – dare we say it? – simply too good for Oscar. Thomas Vinterberg failed to win an Oscar for The Hunt, but at least he’s in the Academy’s favour having grown out of his Dogme beginnings. At the very least, we include this English-language adaptation of Thomas Hardy for Carey Mulligan, whose leading role is surely the biggest possibility for an awards breakout from this potentially-forgettable May release. Oh, apart from the tech and craft awards. Have you seen those costumes?! Robert Redford is Dan Rather, whose final days at CBS News were defined by his damaging report on how President Bush dodged service in Vietnam. Firebrand stuff which seems to be somewhere between Redford’s directorial effort Quiz Show and the acting roles that defined him so well in the 1970s – political thrillers such as Three Days of the Condor and All the President’s Men. A lot could go wrong here with scripting and directing, but the man himself could, if strong enough, be owed a nomination after All is Lost. Certainly the character will require that complex blend of passion, integrity and all sorts of other big traits that frequently become so well-garlanded. Matthew McConaughey wants to kill himself, so goes to the infamous Aokigahara forest in Japan and meets Ken Watanabe, who… presumably… talks him down? This one may not actually be out this year, but even if it is: it may never find favour with the Academy. Emma Stone’s star can only rise after her nomination for Birdman, and re-teaming with perpetual Best Actress role-writer Woody Allen would seem to be a good next move – particularly if this comedic lead part has all the popping verve of Annie Hall, Mighty Aphrodite and Vicky Cristina Barcelona (all of which won their main actresses statuettes). The main problem, unfortunately, is the plot – for two reasons: firstly, it sounds rather light and bubbly, closer to recent duds Magic in the Moonlight and To Rome with Love than his thoughtful Oscar-winning masterworks Midnight in Paris and Blue Jasmine. Secondly, it’s another May-December romance, as fortysomething professor Joaquin Phoenix suffers an existential crisis and shacks up with Stone’s much younger student. This is an agonising tightrope for Allen in light of recent reallegations. No matter how much goodwill he has with the Academy, he’s doing neither himself nor his performers any bloody favours with this. Shakespeare hasn’t done well with Oscar recently, though this is primed for glory with a pointed November release. No matter how successful the film in general is, however, can you really deny the likely power of Marion freakin’ Cotillard playing Lady freakin’ Macbeth? It’s a more explosive marriage than the one in the play! Look out too for Paddy Considine as Banquo (and, presumably, Ghost of Banquo). Two English-language debuts from acclaimed Europeans, Yorgos Lanthimos (Dogtooth) and Joachim Trier (Oslo August 31st) respectively. Sadly, it’s unlikely they’ll get as far as previous years simply because there’s no foreign language nod to fall back on – the perils of going English, really. But with Trier releasing what is likely to be an austere work of genius, and Lanthimos continuing his celebrated dabbles with surrealist comedy either one, or even both, of them, could get in on the “respected auteur” ticket: Bombs, if it doesn’t put too many off with what’ll probably be a certain political spikiness, could go full Haneke while Lobster, if not too bizarre with its sci-fi premise, could be this year’s answer to Birdman. You don’t need a translator, however, to explain why these are such huge “ifs”. Included simply for the buzz at Sundance surrounding Jason Segel. Apparently he’s incredible, Indiewire in particular even basing a review around his potentially being the year’s first serious Oscar contender (with the sad caveat that this almost certainly won’t pan out). Still, David Foster Wallace is a sympathetic enough character for a thoughtful biopic, having written a modern classic/timeless great and eventually committed suicide over an inability to cope with the b.s. of the world – don’t rule anything out, especially when A24 will be doing all they can to push this. Again, it’s all about Sundance and Berlin buzz. For this emotional study of a near half-century-long marriage, Charlotte Rampling and Tom Courtenay swept the acting awards at Berlin. If it’s still remembered in a year (it has a strong-ish late August release in the UK, though currently no US distributor), Rampling could be a shoo-in for Lead Actress (largely because the category favours this kind of role above Courtenay’s male equivalent, for whatever odd and entrenched reason). Do keep it in mind, at least for one year. Richard Linklater won’t get another Best Picture nomination for a while, and it seems unlikely that his cast of unknowns in this college comedy are going to be seen anywhere near key acting ballots in 2016. But for this wistful and fun spiritual sequel to both his beloved Boyhood and Dazed and Confused, Linklater could ride the goodwill of the former (plus 2013’s Before Midnight) straight to a fourth scripting nomination. As we all know by now, the lesson with Oscar is a simple one: for every seeming inevitability, never rule anything out.